Apo Island is in the province of Negros Oriental, in the Central Visayas region of the Philippines, about 30 km (20 miles) south of the provincial capital of Dumaguete. Administratively, the island is a barangay of the town of Dauin; population is about a thousand. Apo Island is well-known as one of the country's many fine diving destinations; one divers' magazine included it on a list of the top hundred destinations worldwide. Part of the area around it is a marine reserve under the jurisdiction of the national Protected Area Management Board (PAMB). It is common to use Dumaguete as a stop-over en route to the island. Any travel agent or dive shop in Dumaguete can arrange transport; most offer both day trips and transport for longer stays. See the Dumaguete article for details. Nearby towns also have resorts that offer day trips to the island. Zamboanguita has Thalatta Beach Dive Resort and Wellbeach Dive Resort, while Dauin has Bahura Resort & Spa and Liquid Dive Resort; see the articles for those towns. Solo travellers may also join other boats for ₱300. It doesn't matter if you stay in the island for a day or a week; the rates are the same. You must arrange for transport from one of the local boats to come and retrieve you for a fee. It is a several mile trip in an outrigger canoe with outboard motor over open water, swells can be large and you can expect to be sprayed with saltwater throughout the trip (wear sunglasses). The boats will generally meet you at Zamboanguita where the Malatapay Wednesday market is held. Take a jeepney from Dumaguete, just ask the driver or conductor to warn you when it is your stop. The island is only 3 km around and 120 m high at the top of the hill; walking will get you anywhere you need to go. One of the Philippines' famous diving sites, Apo Island has one of the world's best known community-organised marine sanctuaries. It's home to over 650 documented species of fish and estimated to have over 400 species of corals. There are also many sea turtles. Diving and snorkeling are the main activities around the island. Resorts on and off the island typically hold diving programs for different skill levels. Instructors are commonly PADI-certified. The diving is excellent, plenty of reefs, tons of fish and turtles, and amazing visibility. Keep an eye out for the Giant Trevally (largest of the jackfish family) which is known in these waters. Apo Island resort - USD25 inclusive of complete gear, boat and divemaster; USD20 exclusive of gear, inclusive of tank & weights, boat and divemaster. Less USD2 for shore dives. Paul's diveshop - ₱1150 for one dive, ₱2200 for 2 dives exclusive of gear. For complete gear, add ₱280 per dive. 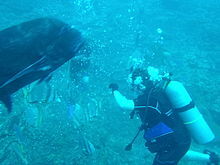 Conservation tax of ₱300 is charged if diving within the sanctuary and ₱200 if diving outside of the sanctuary. These rates are as of June 2009. There isn't much in the way of retail on Apo Island. It's advisable to bring anything that you may need with you because it is a long trip back to Dumaguete. The local women will try to sell you t-shirts and sarongs when you arrive and when you leave. Both resorts have Apo Island t-shirts and hats which are little more than the words Apo Island and the symbol for divers. Both hotels have restaurants, Liberty's has particularly good chocolate/banana shakes. Menus are limited but what is available is pretty good. At Liberty's, the dive master will go table to table during dinner and help you arrange the next day's dives. Several beach resorts at nearby towns offer trips to the island; see #Get in above. There are two publicised resorts on the island, Liberty Community lodge and Apo Island Beach Resort. Apo Island Beach Resort, ☎ +63 35 226-3716. Apo Island Beach Resort is on the opposite side of the boulder from Liberty Community Lodge. 5 min walk from Liberty and in a more secluded cove. The cottages here are made of earth / concrete mix (as compared to Liberty which has a lot of bamboo/nipa). The company that owns this place also owns the Coco Grande hotel in Dumaguete; bookings and transport can be arranged through the hotel. Dumaguete is the main transport hub of the region; most travellers will reach Apo from there and return there after the island trip. It is also possible to spend time on the coast near Apo (in Zamboanguita or Dauin) or to continue south (away from Dumaguete and toward Siaton) after visiting the island, but these are much less common choices. This city travel guide to Apo Island is a usable article. It has information on how to get there and on restaurants and hotels. An adventurous person could use this article, but please feel free to improve it by editing the page.